Is SQ stock poised to rest or go on a big run? Square (NYSE:SQ) has outperformed the stock market and most other names since tech stocks’ Christmas Eve lows. Square stock is up more than 40% from its lows and is now consolidating nicely near $70 per share. Square is far from perfect, though. The stock is much more volatile than the broader market and is susceptible to large moves in both directions. With the market teetering on a potential pullback ( it has risen some 15% from its December lows and is rapidly moving towards its 200-day moving average), Square stock could either be a pillar of strength or a weak link in the chain. If investors eliminate their emotions and rely on unbiased logic, they have a chance to profit from SQ stock. So let’s look at the charts a bit before diving into a wider overview of Square stock. SQ is holding up relatively well, particularly with the overall markets under some pressure after a big, multi-week rally. So far, SQ stock is staying above its 200-day moving average, which is near $69. This appears to be a rather key level when it comes to Square stock. The 200-day was resistance about a month ago, but once Square pushed through the 200-day, this level became support. Furthermore, short-term, uptrend support (depicted by the blue line on the chart above) comes into play around $69 as well and follows the 200-day moving average pretty closely. On a slightly deeper pullback, the risk/reward of Square stock would be solid for bulls. For bulls who are already long, a close below this area gives them a way to reduce their risk. If Square stock temporarily breaks below $69 and recovers in the same day, I would be much more likely to consider taking a long position in Square stock. That scenario would signify that the support of Square stock temporarily gave way, and that bulls responded by buying the shares with enough force to get them back over the key level of $69. So what happens if SQ falls below $69? If that happens, $65 is on the table. That’s about the level where trend support (depicted by the black line) and the 50-day moving average come into play. If $69 holds, becoming support, look to see if Square stock moves over $72 to $72.50. That area is both short-term, downtrend resistance and the 100-day-moving average. 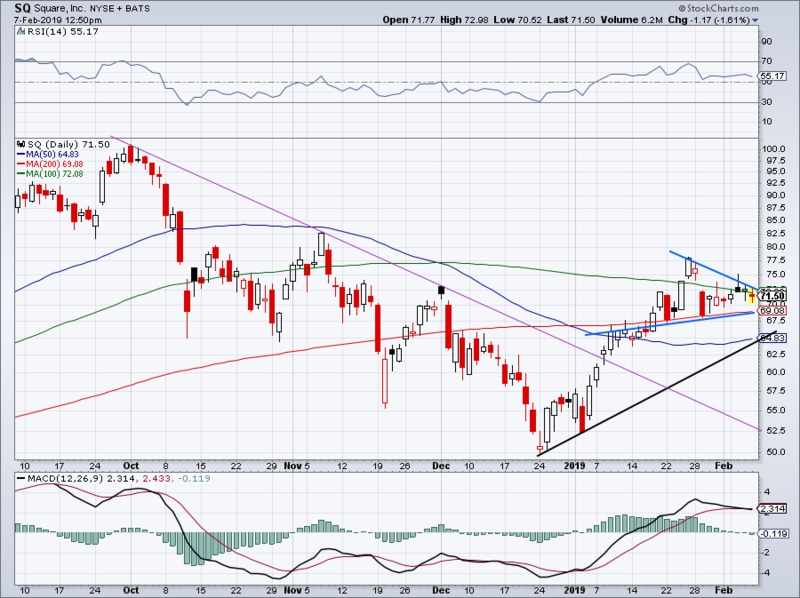 If Square stock climbs above $72.50, it could retest its recent highs near $78. Know your levels and let the price action guide your actions. Don’t fight what the stock price is doing. Square is not cheap and never really has been. However, investors counter the valuation argument with a few observations. Their first contention is that Square could be a takeover target for banks and/or payment processing companies. Perhaps the recent massive deal between SunTrust Banks (NYSE:STI) and BB&T (NYSE:BBT)will kick M&A in the financial sector into high gear. Presently, Square stock is valued at just under $30 billion. It’s also got a surprisingly resilient balance sheet. SQ has total assets of almost $4 billion versus total liabilities of $2.8 billion, while the company has less than $1 billion of total debt. SQ is not on the list of stocks with the strongest balance sheets, but I was surprised that Square wasn’t more leveraged. The fact that SQ has positive cash flow also makes Square stock more attractive. The bulls’ other argument is the company’s growth. Square will report its earnings at the end of February, and analysts expect the company to report strong, full-year growth. On average, analysts expect its sales to surge 60% to $1.58 billion and predict that its earnings will balloon 70% to 46 cents per share. As mentioned earlier, the valuation of SQ stock is high; the shares are trading at 156 times this year’s consensus earnings estimate. But it’s not easy to find companies that are growing as quickly as Square. In 2019, the average estimate calls for a further 43% expansion in sales to $2.25 billion and projects that its earnings will grow 52% to 70 cents per share. SQ stock is still expensive, as it’s far more costly than its peers like PayPal (NASDAQ:PYPL), Visa (NYSE:V) and MasterCard (NYSE:MA). But growth investors won’t mind its high valuation as long as its management continues to deliver. Article printed from InvestorPlace Media, https://investorplace.com/2019/02/how-to-trade-square-stock-right-now-simg/.